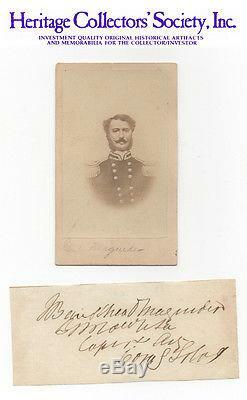 Bankhead Magruder, Civil War Confederate soldier, autograph. Civil War Confederate Major General. Was born to a traditionally Southern family who provided him every advantage they could. He studied at the University of Virginia, then began his military schooling in 1826, attending the United States Military Academy at West Point, and upon his graduation in 1830 was commissioned a second lieutenant in the Seventh Infantry. He married Esther von Kapff in May 1831, but they were rarely together - towards the end of his life, many people were surprised to find out he was married after years of knowing him. His life was the Army, and he excelled at it, no matter where he was assigned; he served in the First Artillery in 1831, participated in the Second Seminole War, then saw battle again during the Mexican War where he was promoted from first lieutenant to lieutenant colonel rapidly under General Winfield Scott's brigade, fighting valiantly at both Cerro Gordo and Chapultepec. When the Civil War broke out, Magruder's loyalty lay with his home state, so he resigned from the Army in April 1861 and enlisted with the Confederacy. Commissioned a brigadier general at first, his skill in the field led to a speedy promotion to major general while commanding his army in Virginia. His specialty was in tricking the opposing forces into making desperate moves; at Yorktown he caused Union general George McClellan weeks of delay by making him believe Magruder's forces had an overwhelming advantage when it actually was much smaller than McClellan's. However, both his hesitancy to attack quickly during the Seven Days Battles and acting on outdated orders during the Battle of Malvern Hill caused him to lose his Virginia command and he was reassigned to oversee the Texas, New Mexico and Arizona district. Arriving in Texas in October 1862, he set up headquarters in Houston and administered his commands from there. The highlight of his career was his brilliant strategic retaking of Galveston from Union forces on January 1, 1863. However, his preference for planning strategy over direct combat caused him to be replaced and transferred to Arkansas in late summer 1864. With the Civil War over, Magruder traveled to Mexico and enlisted as a major general in the Imperial Mexican Army; however, the Mexican empire was already in decline and Emperor Maximilian was executed shortly afterwards. This signature on paper is autograph signed by Magruder and reads J. Bankhead Magruder with his pre-war rank of Captain in the 1st US Artillery. The vintage photograph was originally published by E.
Certificate of Authenticity and satisfaction guaranteed by Heritage Collectors' Society (HCS), Inc. The item "CIVIL WAR CONFEDERATE GENERAL J. Bankhead Magruder, autograph" is in sale since Wednesday, November 16, 2011. This item is in the category "Collectibles\Autographs\Historical". The seller is "heritagecs" and is located in Doylestown, Pennsylvania. This item can be shipped worldwide.